I’m typing this post with a very swollen left hand. I’ve always reacted badly to insect bites. While putting up a wooden fence for a friend yesterday, I disturbed a yellow jacket nest in a bed of ivy. 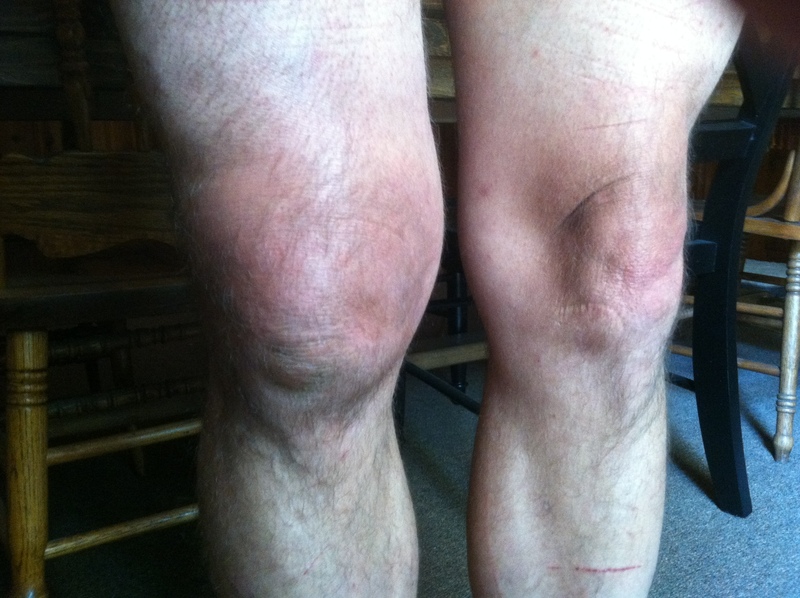 One power-packing bugger hit my in the knee. I killed it and ran about 10 feet away. Then one hit my left hand. I hightailed it away from the area. Fortunately, I only ended up with two stings. 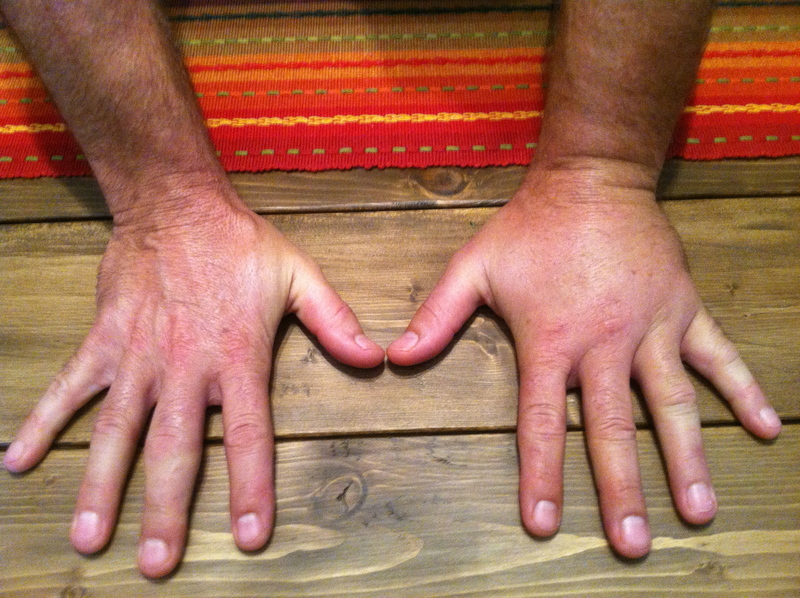 One yellow jacket sting to my left hand and one on my right knee – pictured below. Knowing my reaction to wasp stings, I started walking the yard to find my favorite remedy, plantain leaves. I quickly chewed a few to activate the goodness and applied the greenery on my bites. The plantain immediately worked to relieve the stinging. The painful sting was not my biggest concern. The swelling and reaction worried me. The Band Aid I used to hold the plantain on my knee lasted all of 3 minutes before coming off. Sweat and Band Aids don’t mix well. I used medical tape from my first aid kit to secure the natural remedy to my hand. I put my gloves on and went back to work. Now for the unprepared part. I didn’t have Benadryl in my work/construction kit. Bad move, Todd! I keep antihistamine meds in all my other kits (hunting, backpacking, get home bag, etc. ), but failed to pack any in my construction kit. Had I been stung multiple times, a hospital/doctor visit would have been necessary. Dirt Road Girl gave me Benedryl when I got home that afternoon with an added dose of lecturing about my not being prepared. My wasp encounter left me uncomfortable, but could have been worse. Eastern Yellow Jacket – Yellowish with black bands around its body. Only 3/8 to 5/8 of an inch in length, their smooth stingers, unlike honeybee’s barbed stingers, allow them to inject painful venom in victims multiple times. They build underground nests in cool, shaded areas. When disturbed, their attack zone is about 15 feet from their nest. They will get in your clothes and continue their stinging assault. Steer clear if at all possible! These wasps are actually valuable to have around when they’re not mad at you. Their beneficial in that they kill and eat spiders, caterpillars, and other garden pests. They forage up to one mile from their nest. They’re fond of sweet stuff. You’ll see them hovering over sweets, meats, and sugary drinks at picnics. Stay away from an area if you notice yellow jackets flying in and out of the ground. Avoid wearing brightly colored clothing, scented perfumes, and ‘girly’ smelling body soap. These strong odors and flashy colors attract wasps and bees. If you are allergic to stinging insects, take precautions before you have a run in with these dangerous pests protecting their turf! An allergic reaction happens when your body over-defends against the venom. The key to reducing damage from wasp stings is to treat them as soon as possible. Immediately after being stung, I started looking for plantain. I applied it as quickly as I could chew it. Even getting it on that soon, my hand and knee are still swollen and itchy. People have died from mass envenomation from stinging insects. If you are aware of serious allergic reactions from venom, have your doctor prescribe epinephrine (adrenaline) injecting devices and carry them it in all your kits, home, and office. Topical and oral antihistamines work to help reduce inflammation and itching. Scratching the itchy sting site could introduce bacteria into the skin and cause infection. If you have cold presses or ice available, apply 10 minutes on and ten minutes off (repeat as necessary) to help reduce the itching and swelling. Plantain – Where there is no doctor or medical treatment available, I highly recommend plantain (weed – not banana) leaves. Release the juices by chewing or crushing and apply ASAP. Plantain is a common weed found in most places. Apply a clay/mud pack to the affected area. Wrap it with clean cloth or bandage and allow the pack to dry. Meat tenderizer mixed with water to form a paste can be applied to neutralize the venom. Along the same lines, baking soda and water can help heal the sting. Activated charcoal and water will help as well. Yellow jackets, though small in size, pack a wallop. Take precautions to avoid them, be prepared to treat nasty stings, and don’t let stinging insects keep you from enjoying the great outdoors. When working outdoors, avoid those “orange” hand cleaners. The smell attracts wasps and bees. Never heard of that one. Good to know. Thanks, Tex! DUCT TAPE! that would’ve held it on!!! Hope today is bringing you some relief! Ha! What little bit of hair I have left I wanted to keep 😉 Tightness in the sting areas has gone down this morning. OUCH! I’m sorry for your incident and pain. But I’m sure glad that you shared your wisdom and experience with us. Last Sunday was the first time that we used plantain leaves on a boo-boo. My oldest was amazed with it. Then yesterday he got another boo-boo and he said, “Mom, get me a plantain leaf!” Anyway, I’m going to go get some of our antihistamine pills to put into our vehicle kits. Thanks again! Just went through all of our medicines and threw out a BUNCH of old, expired medicines! Yikes! I need to do that every once in a while, eh? Anyway, we now have a nice assembled first aid kit for the vehicle. 🙂 Thanks for the inspiration, Todd! Good reminder on checking our first aid kits and refreshing stuff. Doing much better today. Not so tight in the hand and knee. I want to make a plantain salve with some essential oils. Just need to find a recipe online. Good stuff from my friend, The Survival Sherpa. It inspired me to go through old medicines and put together a better first aid kit for the vehicle! I use to swell up like a balloon when I would get stung. A native co-worker saw this and got me some creekside mud and covered the stings. The burning pain all but stopped after about a minute afterwards.. The swelling was no worse than what most people get when stung. After doing this creek mud pack trick for about 8 stings later, I no longer get the instant balloon swelling. I still go for mud any ways as a sting relief. Will give plantain leaf a try, but mud is easier to find or make almost anywhere the wasp/bee are. Very interesting, redstone. So repeated use of mud/clay packs has causes later stings to not swell as badly? I’ll have to investigate that method more. I mentioned it in my article but never tried it myself. Thanks for sharing! All I’m gonna say is “ouch.” I hope that you’re swelling has gone down by now. Take care and thanks for the info! Thanks, Tess! Yes, I can close my hand now. Appreciate you stopping by! One of the little stinkers got me on the foot a couple of weeks ago! I ran for the Lanacane. I have the same reaction to stings that you do so it really scared me. The Lanacane stopped the pain for several minutes. When it started hurting, I sprayed it again. It took three sprays but, within a few minutes, the pain stopped. We have a church pew on our front porch. Found out when I sprayed wasp spray underneath it that we had a lot of them in a nest so I was lucky they didn’t all come out to get me. Glad they didn’t all come after you. That’s happened to me before and landed me in the doctor’s office for shots. Stay safe, Linda! really don’t like those little buggers. Been stung 4 times this summer – finally located the nest hanging under my porch steps. The sting next to my eye was the fiercest – hurt for more than a week. Had a bruised face for more than a week. I’ve read rubbing a slice of raw onion directly over the sting eases the pain. Tried that and immediately, the chewed plantain leaf. Nothing eased it even a little. I’ve been stung when I was a wee crotch dropping and I deliberately messed with a nest. I deserved that. There were a few other times when one landed on my hand, and I was unaware, but hey. We have nest out back now, and we treat them like pets. I feed them. They like fish and cat food. They come in the kitchen, and we get along fine. They like my vibes. Last time I got stung, no venom was used. They know me, and it was another case of one landing on my hand and me not being aware, so I accidently brushed it, but what ever. They have an intelligence, and I like them. I feel horrible for flooding a nest out when I lived at a house, but I suppose if I hadn’t done it the future owners would have, since the thing I used to be married to sold it. Apparently, they don’t like my vibe – never have. I don’t suppose you’d recommend this solution to snake bites too, or would you? I appreciate your faith in God first but He also has given us knowledge and resources to use. You may not have time to wait upon the Lord. I just got stung and this is the only place I saw Plantains mentioned. Will look for them or plant some b/c I do have these yellow jackets here and thanks for the info on smells and colors, I had no idea. My Husband just came home from the deer lease and has a stolen, rash, feeling not so hot stung by a yellow jacket. Thank you for your information. What is a plantation plant? It’s called plantain… not plantation. It’s a common weed that grows almost everywhere. Go the search box on our blog and type it in and you should be able to see the plant in a few blog posts.